Animals, from Papoo Games, is an interactive picture book with illustrations, pictures, and sounds drawn from five different worlds. 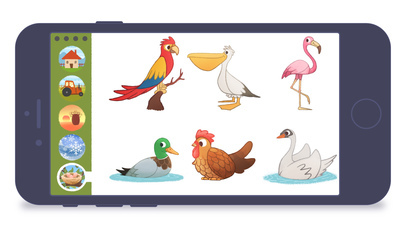 The app has been carefully designed with engaging illustration of various different animals, followed by a selection of real life photographs of the animals in their natural environment. The app does not include any words or speaking and is designed to work internationally, with guidance from parents or carers to take their children through the journey. 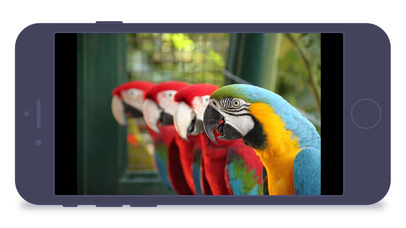 Animals is an app that is easily downloaded and allows you quickly into the heart of the program. The developers describe it as a ‘game’ but I would suggest this is a loose definition and it can be more accurately described as an interactive application that is both informative and engaging. Once downloaded, the child does not need Wi-Fi access to utilize the app; this makes it particularly useful for car journeys or usage outside the house. The screen layout is incredibly intuitive, with a set of five icons to the left of a portrait. Each icon links to the main screen, with a further six icons. The menu icons represent five different environments where animals can be found. The main screen icons represent five typically found animals within each environment selected. Each icon illustration is cartoony and characterful, which enhances the users desire to click on them to discover more. When the child clicks on each illustration, a high quality picture appears that represents the illustrated animal, with an accompanying sound. 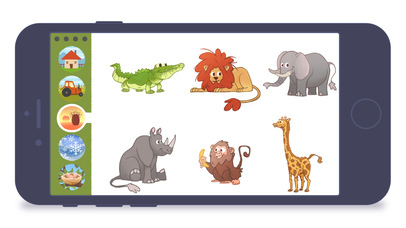 The child can then click on the illustration to return to the environment screen and either click on the same icon or choose another animal from the environment. When the child has explored all six of the animals within the environment they can move onto the next four environment sets. The five environment illustrations include; the home, the farm, hot climates i.e. Africa, cold climates i.e. the Arctic and finally birds. Each illustrated icon of the animal is very well drawn and they are all smiling – including the crocodile, so be warned! Each picture has been carefully chosen to demonstrate the rich diversity of animals and the habitat within which they live. The inclusion of sounds enhances the user experience and is also educational at the same time, for example, can you imitate the sound of a giraffe? A useful addition to the program is the discrete use of a screen timeout, which for any concerned parent or carer is worthwhile. The app will timeout after eight minutes and is neatly illustrated with four circular blue icons which fade out at time intervals. When the fourth circle is faded; ‘the app goes quietly to sleep accompanied by our sweet ending music, inviting your child to stop looking at the screen’. The developers have put together a crisp and sharp website that informs us of the developer team and a selection of other programs available in their portfolio. They also have links out to a Facebook page, Twitter account, LinkedIn and Instagram, so the buyer has plenty of outlets to get a feel for the mission and purpose of the development team. Overall the app is very good and the development team has put together an engaging and educational app. Does your child love to recognize the animals sounds? Or see the animals of the jungle? Suggest them the best interactive picture game. PAPOO is the specialist in playful and educational games for young children. 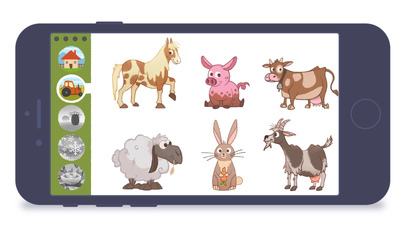 "Animals" is an interactive picture game specially designed for children aged 1-3 years. 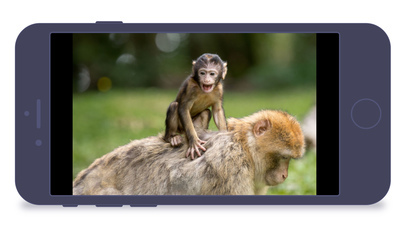 Through 150 beautiful images and sounds, chosen with great care, "Animals" introduces your child to discover our world in a fun and interactive game. The illustrations, both realistic and beautiful, are professionally illustrated to allow your child to safely navigate and explore the game. When your child touches the screen, he will get to experience 5 different worlds. Each drawing in "Animals" is associated with multiple images and sounds, bringing our real world to life. After 8 minutes, when the 4 rounds in the top left corner are empty, it's time for a break. The app goes quietly to sleep accompanied by our sweet ending music, inviting your child to stop looking at the screen. PAPOO, beautiful apps to grow up better !